NEW YORK — Discerning beer drinkers everywhere are ready for the camaraderie and revelry that summer brings. Newcastle Brown Ale, America’s number one selling import ale, is once again serving up summer fun with the return of its popular “Your Beer. Your Glass.” summer retail program that will have adult consumers lining up for Newcastle Brown Ale and, where legal, the chance to claim their own Newcastle Geordie Schooner — the authentic British style brown ale glass used to enjoy Newcastle’s lightly hopped, refreshing style in, none other than, Newcastle, England. “The Geordie Schooner was designed to highlight Newcastle Brown Ale’s smooth and refreshing liquid attributes and provide the drinker with an authentic Newcastle Brown Ale experience,” noted Colin Westcott Pitt, Vice President of Marketing, Newcastle Brown Ale. “The schooner’s nucleated bottom agitates the liquid’s carbon dioxide keeping a strong head on the beer while the concave shape of the glass helps retain the head and captures the bouquet of aromas.” Until now, the Geordie Schooner could be found predominantly in pubs, alehouses and favorite neighborhood watering holes. This summer, Newcastle is offering its devoted fans the chance to experience their favorite import ale at home, the way it was meant to be enjoyed. Colorful Newcastle bottle cap stools and eye catching pint glass standees are sure to draw curious grocery, c-store, drug and liquor store shoppers to the Newcastle in-store displays where they can learn the details of the program’s promotional offer while stocking up for their summer fun. 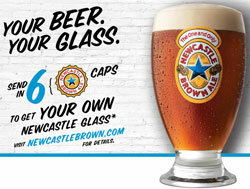 Eye catching POS materials prompt consumers to purchase Newcastle Brown Ale and either mail in six bottle caps or go online to redeem the offer for an authentic Geordie Schooner. Once logged on, curious consumers can explore Newcastle’s engaging and interactive website to learn more about their favorite import ale. IRC and MIR offers on summer’s favorite salty snacks and/or ice (where legal), help sweeten the deal and draw higher traffic to the displays. In addition, “Your Beer. Your Glass.” in-store sampling activations will be popping up in select retail venues around the nation. Those who happen upon such events will be greeted by a Newcastle Brand Ambassador who will reveal the liquid attributes of the “Lighter Side of Dark” Newcastle Brown Ale, and complimentary Geordie glassware offer, while bestowing patrons with refreshing samples of Newcastle Brown Ale (where legal). Newcastle’s “Your Beer. Your Glass.” program hits retail outlets from May 1 through September.